1. 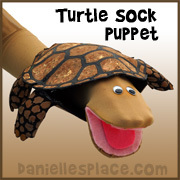 Print out the patterns for the Turtle's Shell, Turtle's Head, Flippers and Tail. Craft tip: Use colored cardstock so you don't have as much to color. Prismacolor colored pencils work great for this project because the lead is soft and covers well without having to press down hard on the paper. 2. Color and then cut out all the body parts. 3. Cut center of the darts on the shell pattern on the side, front and back. Fold down all the dotted lines on the darts. Glue the darts closed to make the turtles body 3D. 4. To finish glue on the head, fins, feet, and tail. 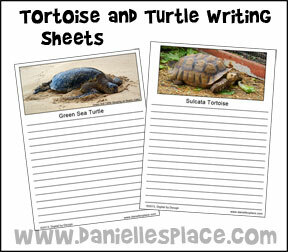 Use these writing sheets with your studies to write facts or stories about tortoises and turtles. 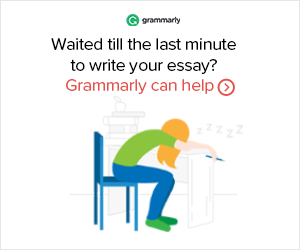 You can also have your children use both writing sheets and compare tortoises to turtles. These printouts are available to members. 1. Cut the bubble wrap the same size as your paper. 2. 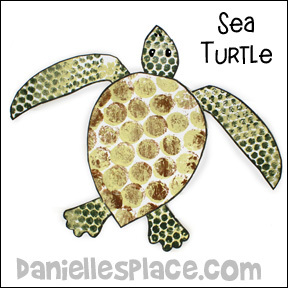 Print out the sea turtle patterns onto card stock. If you do not have a pattern just draw the parts on the paper. 2. Squirt paint into a container and fill your brush or paint roller with paint. 3. Spread the paint over the bumpy side of the bubble wrap. 4. Place the painted side of the bubble wrap on the pattern paper and press down on the bubble wrap to press the paint onto the paper. 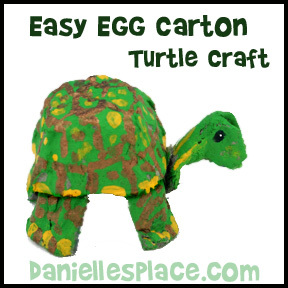 Use the large-bubble bubble wrap for the turtle's shell pattern and the small-bubble bubble wrap on the feet and head pattern. 5. Slowly peel the bubble wrap off the pattern paper and let the paint dry. 6. You can add another color over the first color after the first colored has dried. 7. 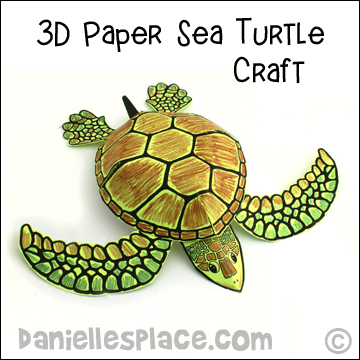 When the paint is dry cut out the sea turtle parts and glue them together. Scissors - Use small scissors with very short blades that are good for snipping if you have them. This will make it much easier to cut the egg carton. Fiskars Kids Classic Pointed Tip Scissors work great. 1. Print out the snapping turtle patterns, cut them out, and use them as templates to cut pieces from the paper plates. 2. To make the body place two 9-inch paper plates together top-to-top and use the pattern to trace the pattern onto the plates. Cut them out. 3. Cut out the scales, legs, and tail patterns and glue them to the body paper plates. 4. 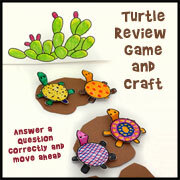 Place the two 6-inch paper plates together top to top and use the turtle head patterns to cut out the head parts. Glue the parts together around the paper plate edge. Punch holes where indicated. Place the bottom mouth part inside the top mouth part matching up the holes. 5. Match up the turtle's body paper plates and punch a hole in the turtle's body where indicated. Place the head between the two paper plates matching up the holes. Attach the pieces with a brass fastener. Glue the body pieces together around the paper plate edge. 6. To finish paint the turtle, glue on googly eyes. Plastic Drinking Straws - Experiment with different sizes and color combinations. The straws will get darker when you melt them and may change color slightly. 1. Use a ruler to measure the length of the inside of the bottle cap and add 1/4". Cut your straws into pieces to make perler beads using your measurement. Try to keep them all the same length as much as possible. 2. Pour a small amount of white glue to cover the bottom of the bottle cap. Let it dry a little before starting so that it is sticky. 3. 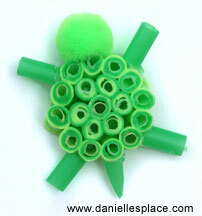 Place the cut up pieces of drinking straws (Perler beads) into the cap. Fill in your design with other beads. Make sure all the beads are touching each other. To make it easier, place a straw bead on the end of a paint brush. Hold onto the bead with your thumb while you place the end of the paint brush where you want the bead. Then let the bead fall down the end of the paint brush and press it down onto the tape. Hold down your design while you remove the paint brush. If you have two different widths of straw beads you can place the skinner straw beads inside the larger ones. 4. Once all your beads are in place heat up your iron. The cotton setting works well. Place a piece of waxed paper or parchment paper over your design just to cover all the beads. Place the iron evenly on top of your design and let it set until the beads start to melt. 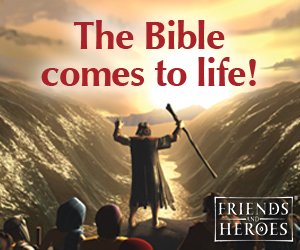 You don't have to press down. You can lift the iron to check your progress. When all the bead are melted together remove the iron. Let the beads cool and you will be able to pull away the paper easily. Pull the design out of the cap and wash off the glue. You may want to melt the beads together a little on the other side of your design. 5. Cut short lengths of straws for the legs and tail and glue them to the design. Glue a pompom on for the head.